Kiera ran on silent feet through the darkened alley. It probably would have been easier to escape if she had shifted into her animal form, but then she would have been stuck without clothes later. That would have been a little hard to explain to the average human. Running for all she was worth, she could sense the vampire’s presence not far behind her. Going into that bar was the dumbest thing she had ever done! Why had she allowed the girls to talk her into it? Shaking her head, she continued to the end of the alley. Hopefully she would live to see another day. When she reached the corner, she looked around. There wasn’t much nearby except an old Victorian home and an auto repair shop. Noticing the lights were on in the auto shop, she hurried across the street. Reaching for the door, she glanced over her shoulder and gasped. The vampire was standing on the corner under the street lamp. To a passerby he would seem harmless, but Kiera knew better, knew him for the predator he was. She was trembling as she watched the vampire; she knew he could smell her fear but was helpless to do anything about it. Pushing the door open, Kiera rushed inside. As soon as she closed the door, she turned the lock. The logical part of her brain was calling her an idiot for thinking a lock would keep out a vampire, but her self-preservation skills were kicking in. That small piece of metal made her feel a little bit safer, even if her safety was nothing more than an illusion. Across the room, Gabriel heard the door close and lock. As he slid out from under the Mustang he had been working on, he noticed the disheveled woman warily watching the street through the glass door. He got up and walked slowly toward her. Taking in her creamy complexion, petite stature and long ebony hair, his body immediately responded to her. She was definitely something to look at, curved in all the right places. “May I help you?” he asked. Kiera glanced back outside. The vampire was still on the corner, watching her every move. She knew that he was waiting for her to leave. It wasn’t fair to involve this stranger in her problems, but she didn’t have much of a choice if she wanted to live. And she definitely wanted to live! Gabriel looked through the glass door. Sure enough, a tall blond man was standing on the corner, watching them. An inner voice was screaming at him that the man was a vampire and to be wary. Gabriel shook his head, clearing the ridiculous thought from his mind. Vampires? He was starting to lose it. Granted, being an alpha werewolf made him believe in the impossible, but he had yet to see proof that vampires existed. “Since I’m offering sanctuary, mind telling me how that guy ended up following you?” If he was getting pulled into a domestic dispute, now was the time to find out. The last thing he needed was an angry husband coming after him. Kiera sighed, realizing she could only tell him half of the truth. If she said that a vampire was following her, she had no doubt she would be dragged off to the loony bin. Granted, that would be the perfect ending to her not so perfect day, but she would prefer to not land herself in a padded cell. Something seemed a little off with her story. If she had been running, why wasn’t she winded? Not that he wouldn’t have enjoyed watching her run in that skin tight dress and heels; it definitely would have been a sight to behold, especially with her being so top heavy. He almost grinned at the image his mind was creating. She knew her excuse sounded feeble, but she couldn’t very well tell him she was a werefox, giving her more agility and stamina than your average human. There were some things that humans just weren’t prepared for. The fact that “make believe” creatures really existed ranked high on that list. “Do you need to use the phone to call someone? It doesn’t look like that guy is leaving anytime soon,” Gabriel said, glancing out the door. Gabriel arched an eyebrow, but didn’t say anything. Just what kind of trouble was she in? She didn’t look more than twenty-one or so. A deep primal instinct arose, making him want to comfort her and protect her. The wolf in him responded to her soft feminine scent while the man responded to her lush curves. She didn’t even reach his shoulder, which told him that she was under five-foot two since he was a little over six-feet tall. She wasn’t bone thin like a lot of woman he’d met, but she wasn’t fat either. Her elfin shaped face held full rosy lips and beautiful green eyes that were almost almond shaped. They reminded him of cat eyes. Gabriel grunted, noting the obvious dismissal. Evidently mechanics weren’t good enough for her. He should have known that a woman as pretty and as well dressed as this one was would have an attitude. Paper pushers were probably more her style; wealthy paper pushers. Walking away from her, he slowly climbed back under the Mustang. It was difficult to concentrate on his work, but he managed. There was something about her that wasn’t entirely human. He knew she wasn’t a werewolf, but she was definitely something special. His alpha instincts told him that she was a mate for his pack. Since Cole was already married, that meant that she belonged to either him or Michael. Just thinking of Michael being with her made him grind his teeth. Kiera watched Gabriel effortlessly slide under the car. She started feeling light headed and realized that she had been holding her breath. He was the most gorgeous guy she had ever seen! Easily over six-feet tall, he had medium length black hair, piercing blue eyes, and was well muscled. It had been difficult to not throw herself into his arms. If he had stood by her much longer, she wouldn’t have been able to keep her hands to herself. She hoped that he hadn’t noticed the effect he had on her. Her animal instincts were going to get her into trouble one of these days. As she glanced back out the door, she realized that the vampire was crossing the street. Startled, she instinctively started backing toward Gabriel. It wasn’t fair to ask for his protection, but she had never been so terrified in her life. She couldn’t put her finger on it, but something about the mechanic made her feel safe and protected. “He’s coming over. I know that I have no right to ask this, but please help me.” As she looked down at him, her eyes were wide with fear. Her heart had doubled its rhythm and felt as it would burst from her chest. Gabriel stood up and drew her close to him. She trembled against his body. He absently stroked her back, trying to sooth her. His extra sensitive hearing told him that the guy was almost to the door. Thinking fast, he came up with a plan; one that she probably wouldn’t like, but he was going to enjoy every minute of it. The vampire jerked the door open, tearing the lock apart as the door was torn loose. While Gabriel tried to process that small fact, he bent his head to Kiera’s and kissed her. He had only planned on a short kiss, more for show than anything else, but when Kiera responded to him he pulled her roughly against his chest and deepened the kiss. Every primal instinct in him was yelling for him to claim her as his mate. Her scent surrounded him and he lost himself in the pleasure of her soft body and warm lips. Find it on Wild Horse Press and Amazon Kindle websites May 26, 2009! This entry was posted in Uncategorized by jessicacoultersmith. Bookmark the permalink. This looks great. I can’t wait to read the rest. I love your descriptions. How did you connect with the idea of werewolves? Thanks Crysta. 🙂 I’ve always had a thing for vampires, shapeshifters, ghosts, and anything else that goes bump in the night. Cole, Gabriel, and Michael actually came to me in a dream… However, the first time around, they turned out a bit different than I had anticipated and “Whispering Lake” was born. Since Cole didn’t get his HEA, I decided to write his tale (Moonlight Protector) … now it’s Gabriel’s turn. 🙂 Michael is also in the works so he will eventually get his HEA as well. 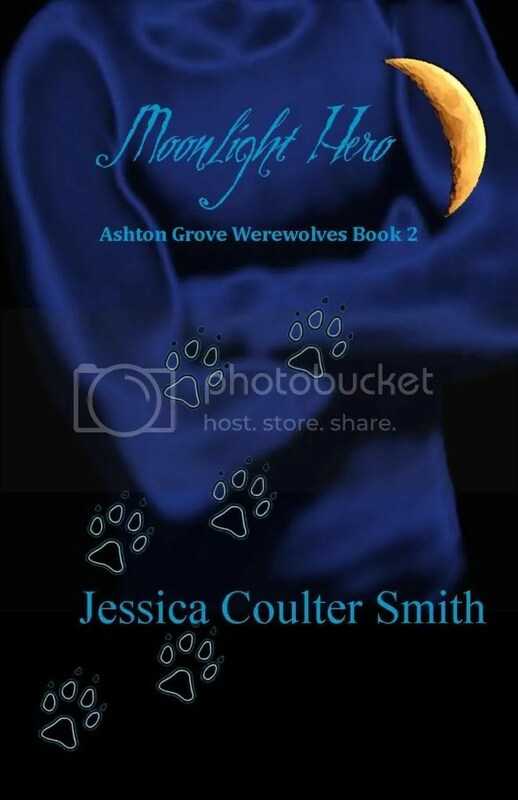 If 15 different people post a comment on Moonlight Hero, I will give away a free e-book copy (pdf) of Moonlight Protector, the first book in this series…. From what I have read and the video makes me want the book even more! I can’t wait for his and Micheal’s story. Hi, interesting post. I have been wondering about this issue,so thanks for writing. I’ll certainly be subscribing to your blog. Are there all e-books or can a person find them in paperback form? The first two are in both formats on Amazon. com and the third will be in paperback around the middle of November.